wagon. My comrade, when the horse began to swim, fell off and was swept away by the current. Thus I was alone with the two women in the wagon to behold the solemn scene, with the judgement of God resting on us." "Pioneer History" by Thomas Startzman states that during the westward journey these three persons were joined by Jacob Wagner, Jacob Deidrick (Dietrich) and possibly Michael Wilt and their brides. On the evening of March 27th they camped for the night at the western end of the "Green Glades". These glades were on what is now known as Rhine Creek, a tributary at the headwaters of the Youghiogheny River —and were first known as the Upper Yough Glades. The following day, March 28th was Good Friday of the year of 1788. While resting and observing Eastertide they were so delighted with the surroundings, the fertility of the soil, the gushing springs, natural meadows, that they decided to stop there for the season. Stough writes: "We found a stopping place in the then called Virginia Glades, one hundred sixty miles from Hagerstown from whence we started, and twenty miles from any settlement of white people." Six other families joined them during the year: Stemple, Rhinehard (Rinehart), Wotring, Ridenour, Harsh, the George Stauchs, and one single young man. 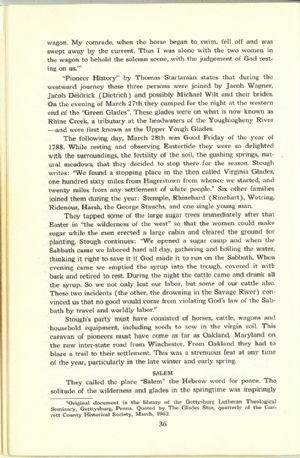 They tapped some of the large sugar trees immediately after that Easter in "the wilderness of the west" so that the women could make sugar while the men erected a large cabin and cleared the ground for planting, Stough continues: "We opened a sugar camp and when the Sabbath came we labored hard all day, gathering and boiling the water, thinking it right to save it if God made it to run on the Sabbath. When evening came we emptied the syrup into the trough, covered it with bark and retired to rest. During the night the cattle came and drank all the syrup. So we not only lost our labor, but some of our cattle also These two incidents (the other, the drowning in the Savage River) convinced us that no good would come from violating God's law of the Sabbath by travel and worldly labor." Stough's party must have consisted of horses, cattle, wagons and household equipment, including seeds to sow in the virgin soil. This caravan of pioneers must have come as far as Oakland, Maryland on the new inter-state road from Winchester. From Oakland they had to blaze a trail to their settlement. This was a strenuous feat at any time of the year, particularly in the late winter and early spring. Seminary, Gettysburg, Penna. Quoted by The Glades Star, quarterly of the Garrett County Historical Society, March, 1962.